Because life is busy but we still want something flavorful in our plate. 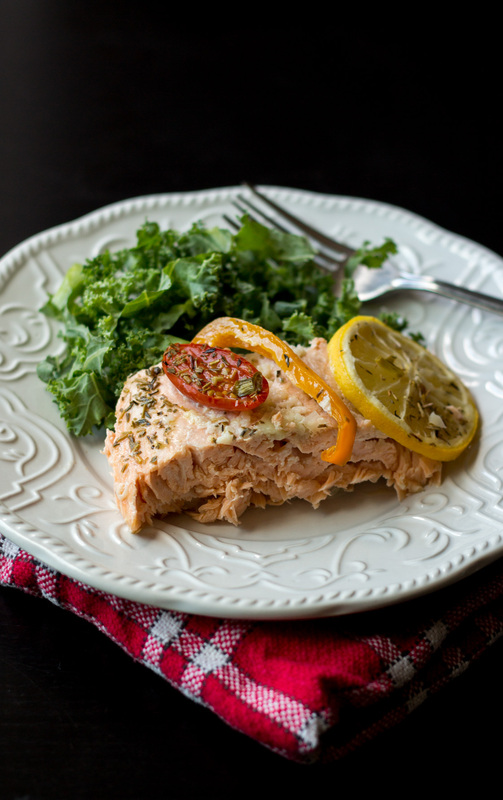 Because salmon is the low calories dish that is nutritious and the whole family will enjoy. Yes, even the kids love it. How about a meal in 30 minutes from the fridge to the table? Tempting, right? And I love saying that I am eating the ‘right’ kind of fat. Ah! I didn’t even have to marinade my salmon because of its freshness. Buy Canadian Salmon, there are so good! With the dish, I used fresh ingredients to enhance my piece of fish. 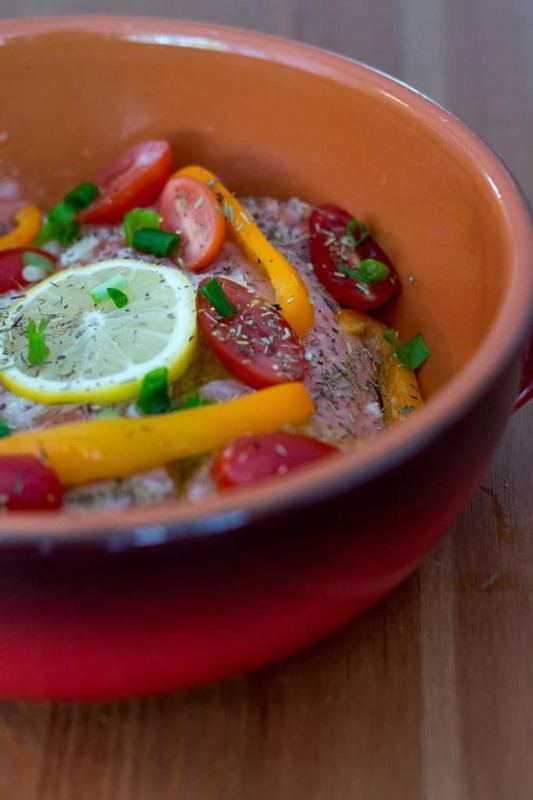 Some lemon, because citrus goes perfectly with salmon and some fresh veggies to add a little fruity taste to it with the pepper and the sweet tomatoes. I didn’t have any fresh herbs (Big sight!) as it would have been my first choice. So I used my Herbes de Provence that smells like home. If you have any fresh herbs then go ahead and use them instead. It’s better. The cooking is pretty quick, depending on your oven, adjust for 20 or 25 minutes. You need to see a pink-flacky salmon. By the way, you remember when I was mentioning that you would see me on W Network soon? I posted, a little shy I must say, a link to the promotional ad available online. I am so exited to tell you that MY day is October 21st on W Network at 9pm! Will you watch? I am really looking forward to it and at the same time I am so nervous, I’ve never been on TV. It was an amazing experience. I don’t appear in this video so be sure to tune in on October 21st! The beautiful host is Anne-Marie Withenshaw and the food critic the intimidating Giles Coren. Also, some celebrity chefs are there with us… Who was in my episode? I’ll let you discover that! Also, follow me on Twitter (@bonappeteat), I will be most likely twitting live. Back to my perfectly healthy, low calories AND loved by kids salmon… Do you see that flacky fish? Pair it with a nice salad, oven roasted potatoes or sauteed veggies. The flavor is so powerful that you don’t need to overdo it. Just enjoy it! - 6 to 8 cherry tomatoes, cut in halves. - In an oven dish, big enough for your salmon, place your shallots to make a bed for your salmon. - Place your salmon and spread all the garlic on it. - Take your lemon and slice it in the middle. Cut one slice of each halves and place if on the salmon. And with the rest of the lemon, squizze all the juice out of it all over your salmon. I got about 2 tablespoon of lemon juice out of it. - Place your peppers and tomatoes on it. 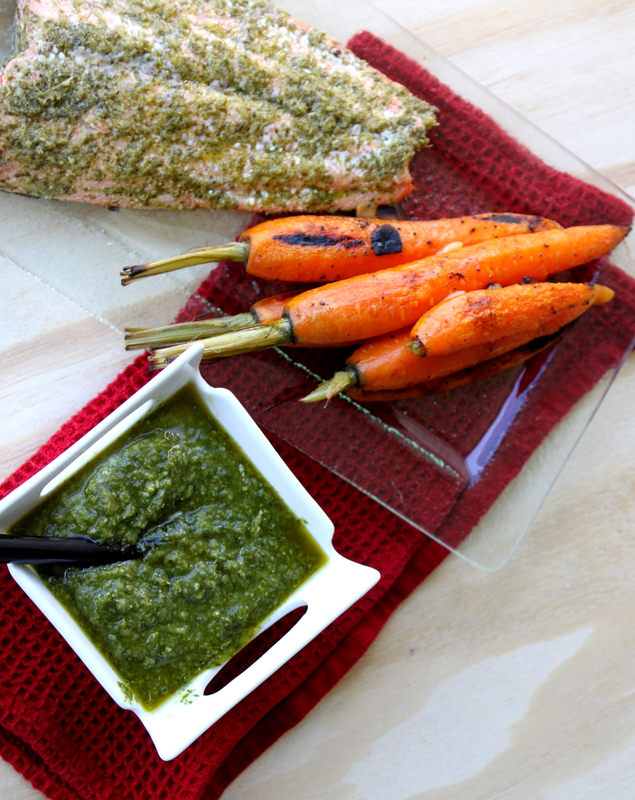 - Sprinkle with your Herbes de Provence and add the drizzle of olive oil. - Bake in the oven for 20-25 minutes at 385F. Thank you so much Cheryl and thank you for stopping by!